Removes general debility. 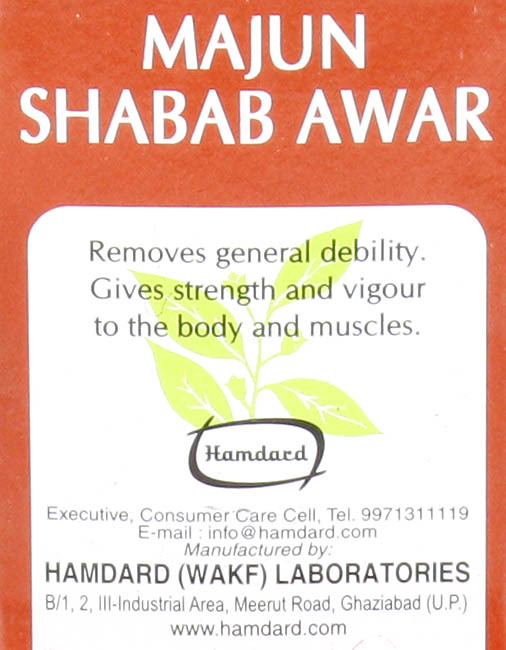 Gives strength and vigour to the body and muscles. For treatment of weaknesses of all kind. Timings : At night or early morning or by 4 p.m. Directions for use: Take one dose with milk or tea in the morning on an empty stomach. Follow this with a light breakfast of milk and one or two eggs. At night, it should be taken 3 hours after dinner. In the evening, it can be taken with tea. While taking Majun Shabab Awar have plenty of fresh fruits. For new life land greater strength take Hamdard’s Lahmina or Maullaham along with this Majun. Each 10 g. contains: Ajwain Khurasani 0.109 g, Ushna 0.055 g, Inder Jo Shirin 0.109, Balchhar 0.055 g, Behman Surkh 0.218 g, Tukhm Piyaz 0.109 g, Tukhm Kahu 0.109 g, Slab Misri 0.109 g, Jawitri 0.055 g, Joz Bua 0.055 g, Khulanjan 0.055 g, Darchini 0.055 g, Mahi Rubiyan 0.218 g, Zanjabeel 0.055 g, Saad Kufi 0.055g, Shaqaqul Misri 0.109 g, Aqarqarha 0.055 g, Qaranfal 0.055 g, Gul Khatmi 0.055 g, Maghz Akhrot 0.109 g, Maghz Badam Shirin 0.109 g, Maghz Pista 0.109 g, Maghz Findaq 0.109 g, Maghz Kadu 0.109 g, Amber 0.004 g, Sat Qehwa 0.040 g, Warq Nuqra 0.109 g, Baiza Murgh 0.206 g, Sugar 7.451 g.